Believe it or not but pornstar-actor Sunny Leone has cracked the Bihar junior engineer merit list with 98.5 marks. Sunny’s ‘extraordinary feat’ came a day after she infamously featured in a video of Cobrapost’s Operation Karaoke. 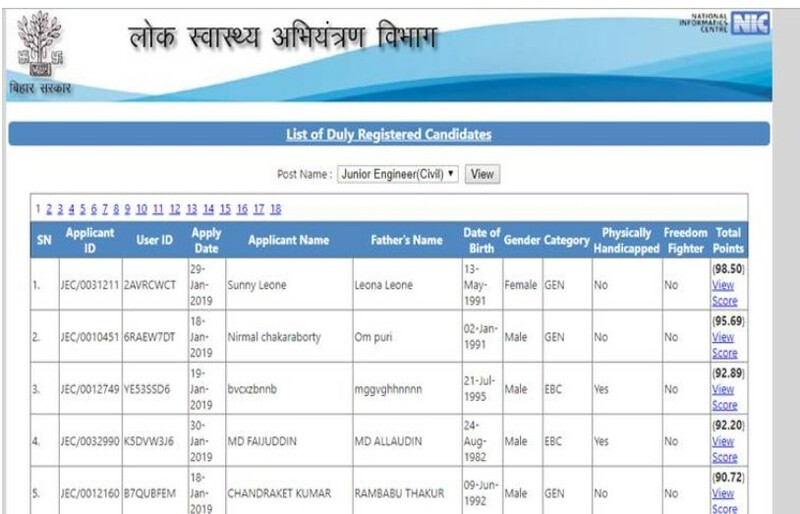 As many as 17,000 candidates had applied for the post of junior engineers (civil) in Bihar’s public health engineering department, but it was Sunny Leone, daughter of one Leona Leone, topped the merit list. The person securing the second rank is one Nirmal Chakraborty, son of Om Puri, while bvcxzbnnb, son of mggvghhnnnn, was placed third. Clearly, Sunny Leone topping the Bihar merit list doesn’t appear to be the Bollywood actress. But, the episode has left the Nitish Kumar government of Bihar red-faced. It has promised to probe the matter. Courtesy to CM Nitish Kumar’s “Farzi Topper Banao, Farzi Naukri Pao” education & recruitment policy ‘Sunny Leone’ tops Bihar junior engineer merit list with 98.5 marks. Bihar has had to face public shaming after some of its toppers in the past were found to have resorted to fraudulent means to secure success in their exams.